Two-time Formula One driving champion Fernando Alonso began his quest to win the Rolex this week. A two-time Formula One World Driving Champion, Alonso tested the team’s Ligier JS P217 at Motorland Aragon in Spain Tuesday alongside Daytona teammate Phil Hanson, with Filipe Albuquerque present as an adviser. Alonso will co-drive the team’s Ligier alongside Hanson and McLaren F1 reserve driver Lando Norris in January’s 2018 season-opener for the IMSA WeatherTech SportsCar Championship. United Autosports will enter two Ligier JS P217s in the 56th running of the classic, with Will Owen and Paul di Resta previously announced as teammates to Alonso, Norris and Hanson. Alonso arrived at Aragon Monday evening and completed a seat-fitting before his first laps in the Ligier on Tuesday morning. Alonso covered 98 laps/483-kilometers while getting acclimated to the car. The day’s checklist had Alonso work through various set-up changes and downforce configurations along with a planned program of low-fuel, new tires runs and full-fuel tank stints. 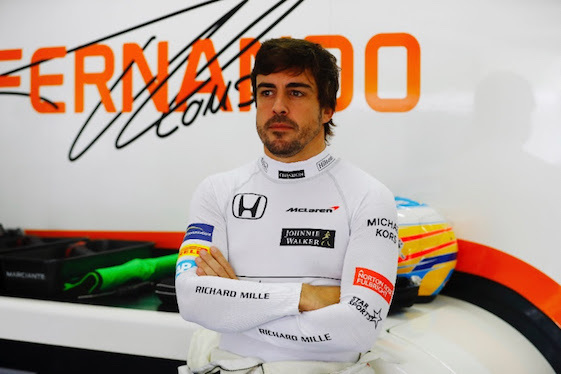 “I had a great first test with United Autosports,” said Alonso, 36, who will complete the 2017 FIA Formula One World Championship schedule with Team McLaren in Abu Dhabi at Yas Marina Circuit on Sunday. “Obviously, we are on a really tight schedule between now and Daytona, but it was nice to jump in the car for the first time. There’s quite a few switches and things to study, so it was important to do this initial shakedown before Daytona, so I could learn fully about the car. Alonso’s next outing in the Ligier will be during the official “Roar Before the 24” test at Daytona International Speedway on Jan. 5-7, 2018. Alonso stunned the motorsports world in April when he announced he would skip the famed Monaco Grand Prix to compete in the 101st Indianapolis 500 in a one-off ride with Andretti Autosport. Already a winner at Monaco in F1, Alonso is aiming to add the Indy 500 and the 24 Hours of Le Mans to his already stellar resume. Alonso, who never had turned a lap on an oval prior to participating in the Rookie Orientation Program at the 2.5-mile Indianapolis Motor Speedway, completed an error-free performance during “The Greatest Spectacle in Racing” on May 28. Alonso qualified fifth and placed 24th after the twin-turbocharged Honda V6 engine in his papaya orange No. 29 McLaren fielded by team-owner Michael Andretti detonated after 179 of 200 laps. Alonso led his first oval-track race four times for 27 laps. Alonso’s Indy 500 experience was organized by California native Brown in his role as executive director of McLaren Technology Group. As was the case at Indy, the Rolex 24 at Daytona will mark the first time the Spaniard has raced a prototype sports car. The Rolex 24 is run on DIS’ 3.56-mile road-course that incorporates sections of the track’s high-banked/2.5-mile oval that is home to NASCAR’s season-opening Daytona 500. Hanson, the reigning Asian Le Mans Series LMP3 Champion, has experience in the Ligier JS P217, having raced in the European Le Mans Series and the Le Mans 24 Hours in 2017. At 17-years-old, Phil became the youngest driver to finish in the top-10 at Le Mans. Norris currently is a McLaren development driver who raced this year in the FIA European Formula 3 Championship, winning the title with two races remaining. His championship win made Norris the youngest-ever European F3 champion. United Autosports is a successful GT and sports car racing team based in Leeds, West Yorkshire, United Kingdom. Founded in 2009 by businessman Brown and racing driver Dean, United Autosports has competed in a number of different championships with a vast range of cars and drivers. The team is a double European Le Mans Series LMP3 champion, having won the title back-to-back in 2016 and 2017. Team-owner Bob Stallings has pulled the plug on his Pirelli World Challenge GT program in a “transition to operate solely as an engaged corporate sponsor ” beginning in 2018. As announced in a release, Dallas-based GAIN SCO/Bob Stallings Racing is exploring potential partnership opportunities in a bid to continue to leverage its racing heritage, corporate brand and successful activation programs. Pirelli World Challenge, North America’s premier GT Production-based sports car sprint series, featured 26 different auto makes with 44 separate models in 2017. Jon Fogarty drove Stallings’ No. 99 “Red Dragon” Porsche 911 GT3 R to a 22nd-place point-finish in 2017. Fogarty’s best finish was a second-place result in Round 7 of 9 during the Grand Prix of Utah on the 3.048-mile/24-turn Utah Motorsports Campus in Toole in mid-August, one of his four top-10s. Fogarty, 42, is a two-time Daytona Prototype Champion with former teammate Alex Gurney. Fogarty’s plans for 2018 were not announced in the release. Since its inception in 2001, GAINSCO/Bob Stallings Racing has earned two championships, 16 victories and 31 pole positions. The team’s driver roster includes Stallings, Fogarty and Gurney, seven-time NASCAR Cup champion Jimmie Johnson, CART champions Jimmy Vasser and Cristiano de Matta, GT champions Darren Law and Wolf Henzler and American road-racing specialists Memo Gidley and Rocky Moran Jr.
“I am very excited about the potential to continue the heritage of the GAINSCO/Bob Stallings Racing program,” Stallings said in the release. “It’s hard not to be humbled by the opportunity to work with so many championship drivers and crew members on this epic journey we have all been part of. “Many special relationships have come out the GAINSCO program. Terry Wilbert, our team manager of 12 years; Kyle Brannan and John Ward, two of the best racing engineers in the business and all the team members who made our racing so fun and successful will be friends forever. In addition, Jim Lutz and Mark Kent of GM Racing, who were so supportive of our championship run in The Rolex Series, and Nick Lester of Porsche Motorsports North America have been invaluable friends and partners of our team for many years and hopefully in the years to come. GAINSCO Auto Insurance distributes policies through a network of independent agents and website marketplaces primarily across the Southern Unites States. GAINSCO, Inc. also specializes in automotive sales and service, auto racing and investments. GAINSCO was established in 1978 in Dallas with a regional office in Miami, Fla. GAINSCO’s insurance company subsidiary is MGA Insurance Company, Inc. Following a championship season in the ADAC GT Masters in Europe, the Corvette C7 GT3-R now is available for competition in North America. Designed and manufactured by Callaway Competition, a pair of GT3-spec homologated Corvette C7 GT3-Rs are scheduled to contest the full Pirelli World Challenge season in 2018, campaigned as a factory effort by Callaway Competition USA. Callaway Competition USA plans to run two Corvette C7 GT3-Rs as a factory effort in 2018. For 2019 and beyond, the manufacturer will withdraw its factory entries and instead offer full support to its customer racing efforts across North American sports car racing. The Callaway Competition USA Corvette C7 GT3-R will be unveiled, and both full-season drivers announced, at the Performance Racing Industry show in Indianapolis on Dec. 7 at the Pirelli World Challenge booth. Following the unveil, the car will be on display for the remainder of the trade show. Callaway founded Callaway Cars in 1977, capitalizing on his passion for maximizing the power of OEM engines. In 1982, Callaway built his first factory and in 1985, General Motors enlisted the operation to create twin-turbocharged versions of the Corvette. In the following decades, Callaway and his company have developed specialist models for manufacturers including Aston Martin, Range Rover and Mazda. In an agreement with GM, Callaway was authorized to design, build and homologate the GT3 version of the C7 Corvette. Callaway Competition GmbH most recently secured the 2017 ADAC GT Masters championship. Following Cadillac Racing’s withdrawal of its factory program from the series at the conclusion of the 2017 season, the Corvette GT3 effort was aimed at North American competition. The Pirelli World Challenge was selected for the debut as its SprintX format closely matches the GT Masters format of two drivers splitting the duties for a one-hour race. PWC will host 10 weekends in North America in 2018 beginning with the season-opener on the streets of St. Petersburg, Fla., March 9-11. Watkins Glen International will host the 2018 Pirelli World Challenge season-finale with a Labor Day racing weekend Aug. 31-Sept. 2 at the legendary 3.45-mile/11-turn road-course in Upstate New York. Pirelli World Challenge’s return to The Glen will feature the entire PWC division lineup including GT (GT/GTA/GT Cup), GTS (GTS/GTA) and Touring Car (TCR/TC/TCA) in a three-day program with double-header sprint races. The finale will feature traditional 50-minute sprints for GT and GTS classes and 40-minute features for Touring Car classes. The last PWC event at Watkins Glen was held in 2010 with sports car stars Ron Fellows (GT) and Peter Cunningham (GTS) winning the top two events and Robert Stout claiming the Touring Car race. The Pirelli World Challenge premiered at Watkins Glen in 1992 and has featured eight PWC years (1992, 1996-1998, 2007-2010) at the famed facility. Watkins Glen’s extensive racing history dates to its first race in 1948 with an event run through the village streets. The Glen’s legacy as “The Birthplace of American Road-Racing” was solidified with the facility hosting 20 Formula One races from 1961 to 1980. The Watkins Glen PWC double-header will wrap up the 10-event schedule. The series also has added a stop at Portland International Raceway on July 13-15 for the 58th Rose Cup races. The PWC event fills a void created when the Verizon IndyCar Series abruptly opted to not return to The Glen in 2018 after competing on the resurfaced layout in 2016-17 in place of a proposed street race through downtown Boston that failed to materialize. Watkins Glen International renewal customers can purchase tickets and camping for the race weekend from Thursday, Jan. 4, through Tuesday, Jan. 9. Ticket availability for the general public will begin on Wednesday, Jan. 10.